The roots of modeling animals in sculpture dates back beyond the ancient Egyptians, however, it was the artists of the American West who sought to capture the nostalgia for the vanishing West through its wildlife. Each scene captured in bronze tells a story, rather than a pure documentation of nature. 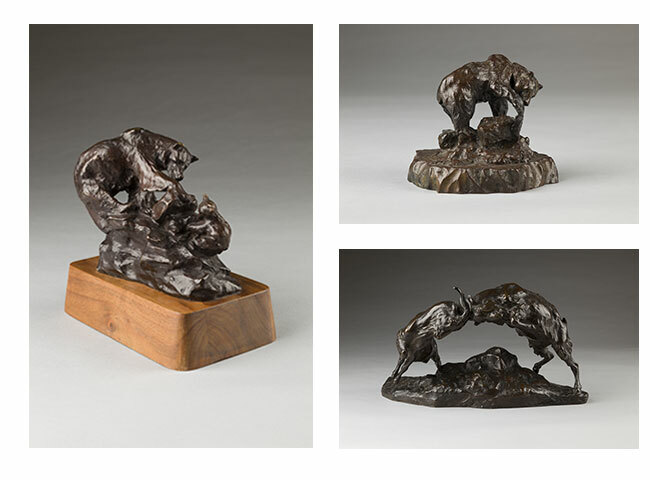 Included in the exhibition are traditional Western sculptures by Charles M. Russell, which demonstrate the artist’s keen ability of observation to depict the playfulness of the mother bear and her cub. Other artists use the bronze medium to capture a dramatic moment in time. Contemporary sculptor T.D. Kelsey, for example, purposefully models the bronze to depict the contracted muscles of galloping horses, creating intense tension with lines and motion. The iconic imagery included in this exhibition is rooted in American history and is a truly American subject that generations of sculptors have cultivated and incorporated into a distinct genre.